This is a distinctive piece of jewelry with silver patterns constructed in a meticulous way. The pendant is made entirely of high-quality sterling silver. 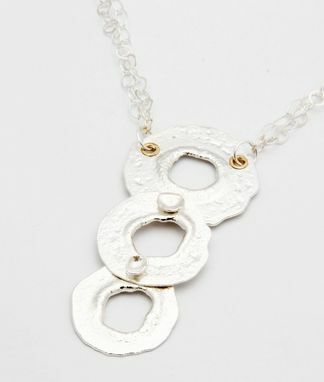 The chain, also made from the same metal, holds the pendant through two brass-accented holes. The pendant measures 3 inches in size while the chain measures 18 inches. If you wish to have the chain adjusted to a different length, kindly inform me.